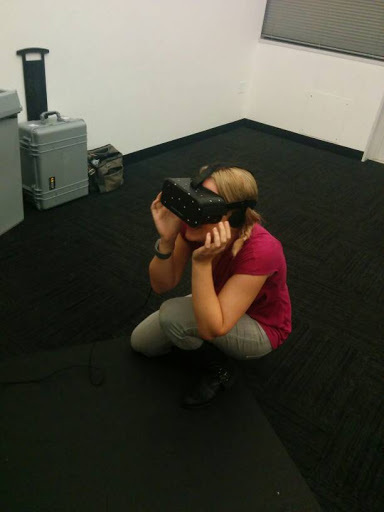 Yesterday was the Silicon Valley Virtual Reality Holiday Party and it was freaking awesome! Hosted at the Computer History Museum in Mountain View, the SVVR meetup party was host to a wide assortment of companies and application demos, but the Oculus Crescent Bay headset stole the show with a line that took over 2 hours to get through. Sixense handed off their first production unit to the SVVR organization team, Google provided Cardboard headsets for everyone in attendance, Altspace VR had a demo booth, and there were so many awesome demos, I lost track of them all! At Oculus Connect, the VR headset company acquired by Facebook announced their third prototype towards the consumer-ready product and today, I had a chance to try it out! The Crescent Bay was smaller and lighter than the DK 2 that I have, and there was a noticeable improvement with how comfortable it was to wear. The side straps were easier to adjust and I didn’t notice the same “nose gap” that I have with the DK 2. I felt a little more mobile with it (the cabling seemed lighter than the DK 2) and of course, the experience was totally immersive. I didn’t care that there were probably a ton of people laughing as I dodged things they couldn’t see – I just wanted to avoid the massive monster that the NPCs around me were shooting at. The only letdown that I had was that the headphones that are built into the Crescent Bay were on-ear instead of over-ear, so there was still some ambient noise that got in from the surrounding room. As much as I love the idea of having audio playback integrated into the headset, I tend to personally be picky about headphones so I could see this being an area that could still use improvement before it has the complete package. There was no news on when it would be available, but judging by the immense line, there’s a huge amount of interest and folks were willing to wait for a LONG time to try it out. Sixense, a company with a solid presence in the SVVR community, handed over their first production units in a ceremonial fashion to the organizers of SVVR and had their Star Wars themed lightsaber-training demo set up, this time using the newly released Samsung Gear VR HMD and a Galaxy Note. I tried it out again (partly because I freaking love that demo, and partly because I wanted to see the comparison between the Gear VR and DK 2 experience) and I have to say that it was, again – TOTALLY FREAKING AWESOME. I don’t notice the pixellation because I’M A JEDI KNIGHT. On a serious note, though, I didn’t really have an issue with resolution when I was using the demo, and I actually preferred this experience with the Gear VR. Firstly, the Gear VR has the immense benefit of not being wired, so I was able to spin around in full circles and switch which hand I had the controller in very easily. It felt much more natural to move with the Gear VR because the HMD is lighter, and when you don’t have to worry about tearing yourself away from the computer and damaging anything, it becomes way easier to just let loose and enjoy the immersion. 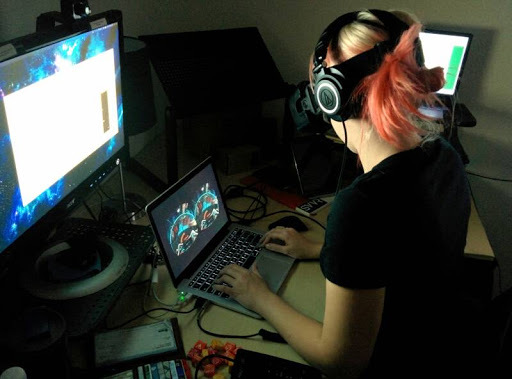 Now, I do recognize that resolution is a really important part of VR, and I am totally not trying to say that mobile VR is on par with desktop – it definitely isn’t. But at the same time, there are a lot of benefits to mobile VR that the Gear VR seemed to just nail, and I think that it’s important to recognize the differences there. Just like not everyone who plays a video game has a high end graphics PC, there are going to be people who want to experience VR without a ton of specialized hardware other than the HMD. The Gear VR shows that this is absolutely do-able, and it’s one of those things that should be kept in mind when naysayers are running around decrying how cool the Gear VR is. For something like the Sixense demo, when you’re in a simple environment with an interesting mechanism and rendering complex, realistic textures isn’t as big of an issue, the resolution essentially becomes a non-issue for casual use. The SVVR meetups are hands-down some of my favorite events to go to – if you’re in the Bay Area, GO! There’s no reason to wait! In unrelated news, my Gear VR came today! I’m looking forward to taking some time this weekend to do a comparison video with the DK 2 and my Cardboard!